Printable card projects galore for card crafts, plus packaging, borders and back-grounds for scrapping and other paper crafts in this huge, fun range of fashion crafts. The printables are perfect for lovely gift baskets too. Delight a fashionista friend - or yourself! 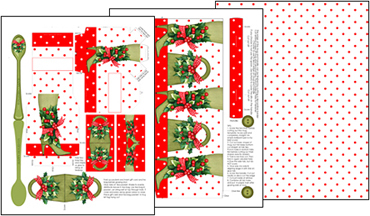 • BONUS: A set of contrasting Xmas Green Pattern Pages with dots, stripes and gingham for coordinating crafts. A card kit with lots of elements for lavish 3D layering, plus little tags to attach to the bag. There is also a card for straight printing out for a quick card – or it can be used as a first layer. Perfect for lovers of fashion and fashion crafts. • A handbag topper and tags. • Nine layer elements for lavish layering. A card in the shape of a boot with lots of layers for lavish 3D layering, plus little tags to attach to the boot. The card is tall and is in two parts. It will need an envelope which fits a Letter size or A4 page. A fun "suede" handbag packet/bag for fun Xmas fashion crafts with optional layering to make it even more special. This mini set has a mix of products for variety. Little bags, card items and tags make this set useful for gift packaging, card making and gift tagging. Two pages with Xmas Boot and Bag designs. The design can be trimmed to either a 100g European chocolate slab or to a smaller Hershey bar size for unique wrappers. Perfect for a quick gift for a fashionista friend. • A set of contrasting Xmas Green Pattern Pages with dots, stripes and gingham for more coordinating paper crafts. The Xmas Fashion 3D mug is just right to hold a small fashion accessory for a fashionista friend. A mini set has a mix of products, while the 3D layer card, handbag/purse and boot have lots of elements for lavish layering. A square card, tall card set and card kit is joined by a boxed notelet set for all your Christmas stationery needs. A lidded "shoebox" is a great gift box, choc wraps are perfect for quick gifts and a bunch of borders, tags and patterned papers allow for more versatile crafting. Bonus pattern pages in Xmas Green geos too. The traditional greens are a nice foil for the olive greens in the set. Are you a fashionista girl? Would you like to see more Fashion Xmas products?